I saw a version of Bobbi Morse (Mockingbird) in Agents of SHIELD… though only a brief scene, since I haven’t actually seen season two; I just managed to watch a video clip. I think that the characters who don’t have any special powers are pretty interesting in the Marvel universe. Bobbi was clearly highly trained and a strong female character. In the last four comics, she had obviously been damaged psychologically by what had happened to her after she’d been taken. There seems to be a lot of instances of characters, heroes mainly but also some villains, being killed and then being resurrected in the Marvel universe. I felt the explanations in this set of comics made sense as to how Bobbi had come back, though. I liked seeing the interactions between Clint and Bobbi… and it was also pretty cool to see a different version of Clint in the second set of comics. As always, I could see the obvious differences in the artwork styles from the first comic, which appeared much more family friendly, to the next four… which seemed more digital, not to mention clearly aimed at adults. It was interesting to see the new version of Captain America and how different he clearly was to Steve. I also liked seeing Clint’s interactions with him… how he clearly didn’t respect him in the same way he did Steve. Even if he did originally call the new Cap for help, I got the feeling that was just because he felt like he had to. It was good to see Bobbi team up with Spider-Man in the first comic. I was a bit confused as to why she came across as a bad guy to begin with… but as the storyline went on, it became clearer as to what was going on with her. I liked the fact that there were flashbacks in the second set of comics, but it did get a bit confusing at first when I found myself viewing a scene from the past. I would have liked to know a bit more about the Skrulls, since this is the second comic book that features them. 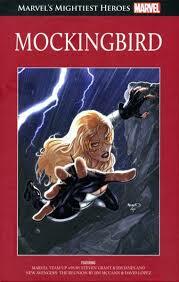 This comic book has triggered my interest in seeing more of Bobbi’s adventures and how she deals with the emotional scars she carries. I’d also like to see more of the second Cap and learn more about him.